The wait to see and photograph the end of Knox Gorge was finally over. A visit to Karijini National Park a year prior had left me some what frustrated and itching to return. 4 days of straight rain killed any chance of good light in the gorges and had made a section of Knox Gorge too risky to pass to make it to this section. This is a top down view of the gorge from deep within it. A cascade carves its way through the gorge and then falls into a beautiful pool that has a stunning aqua blue colour. I absolutely love photographing Karijini. Such a special place. 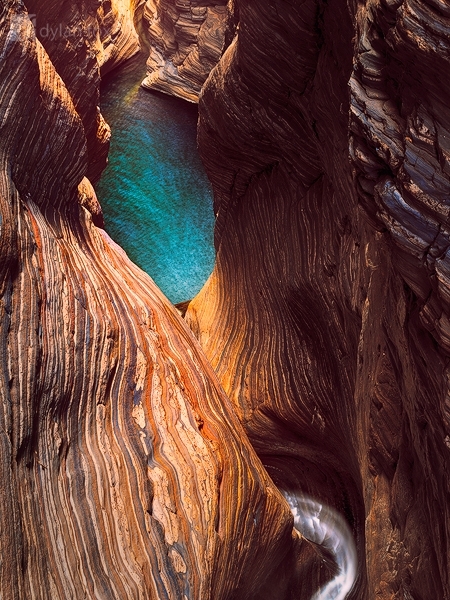 Secure your limited edition, Karijini photographic print, 'Serendipity', by selecting your desired print size in the menu to the right.